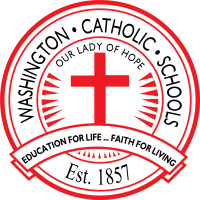 Since theology and religious study are at the core of every discipline in the Catholic school, it is necessary for students at Washington Catholic High School to complete eight semesters of Theology with passing grades in order to graduate. An exception will be made for students entering after the start of Grade 9. In addition to the individual and particular requirements of the different courses, the school requires twenty-four hours of volunteer service per school year. There are to be 8 hours for school, 8 hours for community, and 8 hours for church. Each student must have 6 hours following each grading period (2 hours for school, 2 hours for community, and 2 hours for church). Incomplete hours will result in an incomplete grade in Theology for that grading period. After one week, the incomplete will convert to a grade reduced by two letter grades. This service requirement is based on the example of Jesus, who stated that He came among us “not to be served but to serve”. (Matthew 20:26). WCHS believes that service to others is an integral part of the educational program of the school and that all students will find it rewarding and helpful in their growth of Christian values. The required hours must be divided between service to church, school and community. Students should notice that not all of their service requirement can or will be met by service done in conjunction with school. These required hours must be diversified and performed in several ways in various times and places. A list of service examples in each category will be sent home at the beginning of each school year. It is the individual student’s responsibility to provide the high school theology teacher with written documentation of the service performed. The theology teacher may stipulate how these six hours are to be conducted and recorded in their respective courses. Satisfactory grades in theology are a prerequisite for extracurricular activities and graduation. Extracurricular activities are defined from time to time by administration and include, but are not limited to, athletics, clubs, and band. A student receiving a failing grade in theology for any reporting period within the school year will be denied participation in extracurricular activities for the ensuing reporting period. It is the policy of WCHS that graduation from the system is contingent upon successfully passing theology every semester while in attendance and completing all service requirements. 1. Students must not have a “D” or “F” in any class for the first or second grading period, or for the first semester. 2. Students must not have had any suspensions prior to departure for the Pilgrimage. Parents should understand these policies as they relate to the refund policy of the Diocese of Evansville (see last year’s policy below). Due to cancellation policies with the hotel and bus company we are unable to provide refunds to those who have registered and paid, but are not able to attend. Participants may receive up to a 90% refund if that spot can be filled with another person AND they notify us on or before the deadline dictated each year by the Diocese of Evansville. 1) An authorized signature for the project(s) submitted should be from the adult supervisor of the project, not the parent. 2) Something cannot be recorded as “service” if payment has been received or other forms of compensation are given. 3) “Service” is activity completed outside of the school day. 5) Families are important. Assisting with one’s family is an expectation that shows the love, devotion, and care for family. Helping an uncle, cousin, grandparent with things like mowing or painting is not service. The same is true with babysitting a sibling’s children, etc. 6) “Community Service” done as a part of disciplinary action for the Dean of Students cannot be counted as volunteer hours. 7) There are no buy-outs for service hours. This includes money, pop tabs, food, clothing, and/or toys. 8) The possibilities are endless. If a student (parent) is unsure of what activities might be appropriate or have questions regarding service hours, please contact Mr. Joe Brake, Washington Catholic High School Theology Teacher. 9) The Washington Catholic High School and teacher, Mr. Joe Brake, reserves the right to make inquiries regarding validation of service hours submitted. 10) Students are expected to complete all information requested on the Service Form. 11) Two (2) hours of service in each area must be completed each grading period for a total of 24 hours of service per school year. Students will be asked to work at school to complete any service hours remaining at the end of the school year. 12) Incomplete hours will result in an incomplete grade in Theology for that grading period. After one week, the incomplete will convert to a grade reduced by two letter grades. 13) No rollover of hours. Students must complete 8 hours of service in each area. Students may not complete 10 hours of service to the school and use the extra 2 hours for another area. Volunteer work in hospitals, day care centers (other than Cardinal Care – school service), Assisted Living and extended care facilities, etc. Habitat for Humanity, American Cancer Society, Relay for Life, etc.